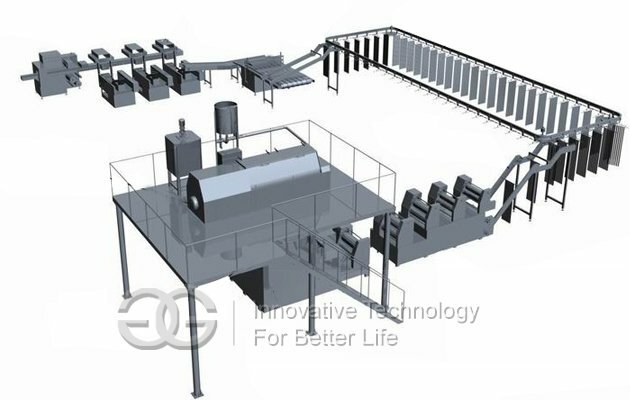 Automatic dry stick noodles production line of Henan GELGOOG Machinery adopts vacuum mixing technology and photoelectric control technology, with output 3 tons/8hours. 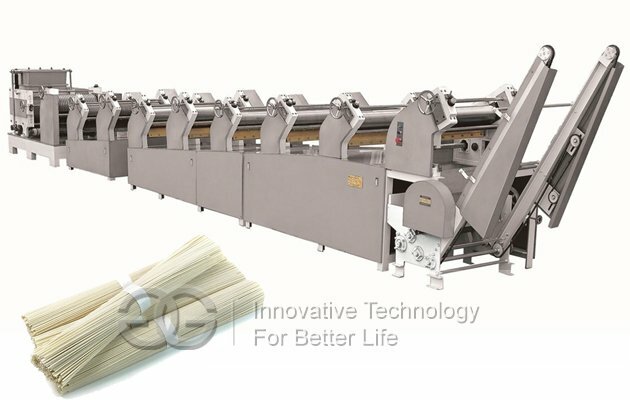 Low temperature double chain Stick Noodles or Dry Noodles production line of Henan GELGOOG Machinery adopts vacuum mixing technology and photoelectric control technology, as a symbol of the third generation Hanging noodles production line, representing the advanced level of the domestic industry. The production line is equipped with excellent equipment, and the whole process is highly automated, it can be operated, and production continuity is good, the product quality is excellent, the finished product rate is high, and the energy consumption is low. 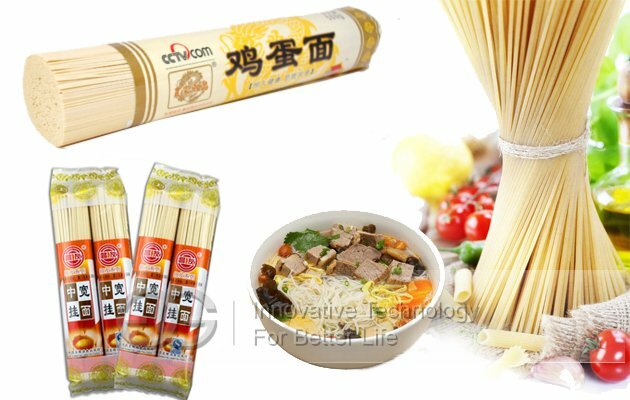 The dry noodle machine is with the advanced technology, high degree automation, frequency conversion, PLC controlled, the weight of noodle cake can be adjusted automatically while the line's running, the temperature of the frying can be auto controlled, the line running safety, and easy maintenance. 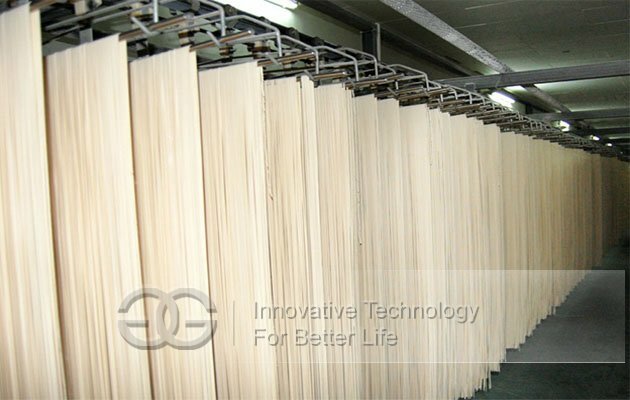 The oil content of the noodle cake is low and the capacity of the line is high. The mixer with double shaft and speed, more water feed, more even for the flour and water's admixture, the feeder with type double pan to guarantee the flour's according aging, the roller with 9 pairs of alloy steel, and steaming noodle's flavor by soaking process. With liquid level display, round tank, stainless steel. 2 Double Shaft and Speed Mixer GGHMJ200 1set Motor power 6.5/8kw, 150kg/batch, manual opening, food contact parts are made of stainless steel and nylon. Contact part is stainless steel. 5 Hanging Stick Supplying Machine GGGT450 1set Power 1.5kw (frequency control), noodle length adjustable, front and rear uniformity adjustable. 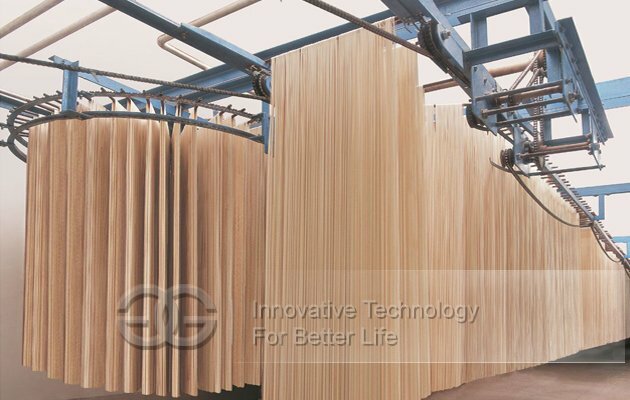 8 Chain Plate Drying Machine GGPHF30 1set Main power 3kw (frequency control), industrial fans 0.75 kw ×13 sets, moisture removal fans, 4 kw×1set(or 0.6kw*6sets), 4 rows rod, length 50m, drying time 4hours. Stainless steel noodle hanging rods 4000pcs. 10 Automatic Hob Cutting Machine GGZQM50A 1set Noodle length adjustable 120～290mm, power 0.8kw.